Men and energy is inseparable. Since the industrial revolution began in the Great Britain on the year 1750, the condition on social and world technology has been made possible for men to use huge amount of energy consumption in order to support men’s life activity. In modern era after industrial revolution, began the era of huge amount of energy consumption, until present day. In 2011, Indonesia consumed about 1237 million BOE with 7% growing rate each year. Ironically, more than 95% of this consumption need came from fossil-based resources (e.g. oil, charcoal, etc.) meanwhile the renewable energy resources that been used is only 5%. The details of Indonesia’s energy consumption can be shown by the picture below. This enormous amount of fossil-based energy consumption is becoming a problem since the quantity of such resources is decreasing every day. The four sectors that have been using large number of energy in Indonesia are (1) Industrial Sector (2) Transportation (3) Household, and (4) Commercial use. Indonesia is rich in resources whether the fossil-based or not. Hence, it is not wise if Indonesia only rely on fossil-based energy such as petroleum energy since the national and even world’s fossil-based energy reserve is limited and will eventually ran out. Indonesia is facing the decreasement of fossil-based energy reserves since there is no balance yet for the use of alternative energy resources or renewable energy. The important fact about Indonesia is that this nation is not in the category of “country that is rich in fossil-based energy resources”. Indonesia’s oil reserves per capita is under the world’s average standard oil reserves. Currently, Indonesia is ranked in 9th on crude oil reserves per capita, which is 0,05 barrel per capita. Meanwhile, Kuwait is 0,827 barrel per capita, Venezuela 0,078 barrel per capita, and Russia 0,056 barrel per capita. With the growing 7% rate of energy consumption every year, affecting the increasement of primary energy needs. Unfortunately, the effort to fulfil the needs of energy in Indonesia obstructed with inadequate infrastructure. Everyday, the fossil-based energy is decreasing. Still, men hasn’t noticing the reserves of such resources is finite. If we ran off of the fossil-based energy, which is we are depending on it heavily, will be confused and miserable. Whereas the mandate of Indonesian Constitution article 33 paragraph 3, obliged the government to manage all the resources for the prosperity of the people. To change the paradigm of national energy management is the solution for the current condition. 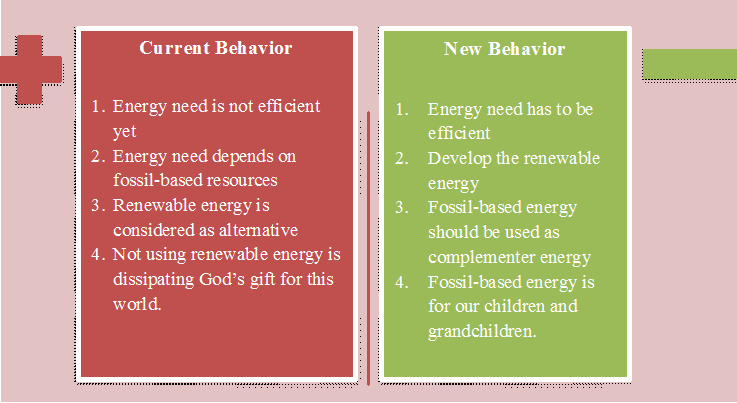 We should shift the current behavior in energy consumption to a new one. Take a look at the picture below. 1. Use of energy efficient appliances, such as heat exchanger and mixer, resulting electricity saving. 1. Creating new policy or regulation concerning efficient energy in industrial, household, and transportation sector. 2. Creating a new public policy concerning energy conservation in order to establish guidelines in energy saving. 2. Conduct National Energy Awards for building and industrial sector in order to raising public awareness concerning energy saving. 1. To give socialization and training on schools in order to raise student’s awareness in energy saving. Preparing the Certification Institution for Energy Manager and Auditor. The jobdesk of manager is to monitor and evaluate, which includes taking measurements, making notes, prepare reports and recommendation on improving the execution of the energy conservation program. 1. Provide information to consumers about energy efficiency level of electric home appliances, and to encourage manufacturers to increase their quality of products especially in the field of energy efficiency. 2. Program “More Star, more efficient” on electric utensils. Including information about the absolute energy efficiency of the product. 3. Usage of lamp with CFL label (Compact fluorescent lamp) as a pioneer for electric home appliances. As a matter of fact, using CFL can reduce 75% of energy needed, to give the same amount of illumination, and last up to 10 times longer than conventional bulbs. Building a information center office for energy conservation. If we, including government, society, and all of the nation elements, truly concern about this “saving energy” issue, Indonesia will able to be much more independent in energy sectors. By saving energy, either the simple or advance way, we can help this nation to manage energy consumption. The government also has to always educate people to switch the old energy resources such as fossils fuel, to the sustainable ones. Each of us has to believe that we have a huge part in saving and sustaining energy as much as we could. Who else would do such thing for the future generation, but ourselves? Primary energy is the kind of energy which has not been processed by advanced technology, which required to produce final form of energy. E.g. petroleum, natural gas, hydropower, geothermal, charcoal, etc.